The Rosetta Stone: cast is courtesy of the British Museum, Rashid, Egypt, c. 196 BCE. This stone tablet inscribed in 2 languages and 3 scripts was discovered in 1799 by Napoleon's expedition at Rosetta along the Nile. The Rosetta Stone was an invaluable key in the deciphering of the mysterious ancient hieroglyphs. After 2000 years an ancient, forgotten language comes to life again. The ancient Rosetta Stone has been cast directly from the original by the British Museum exclusively for this spectacular traveling exhibition. The history, the discovery, the translation - all accompanied by rare, authentic artifacts from Ancient Egypt and the Cradle of Civilization. Lapis Inlay Necklace, c. 3000 BCE. 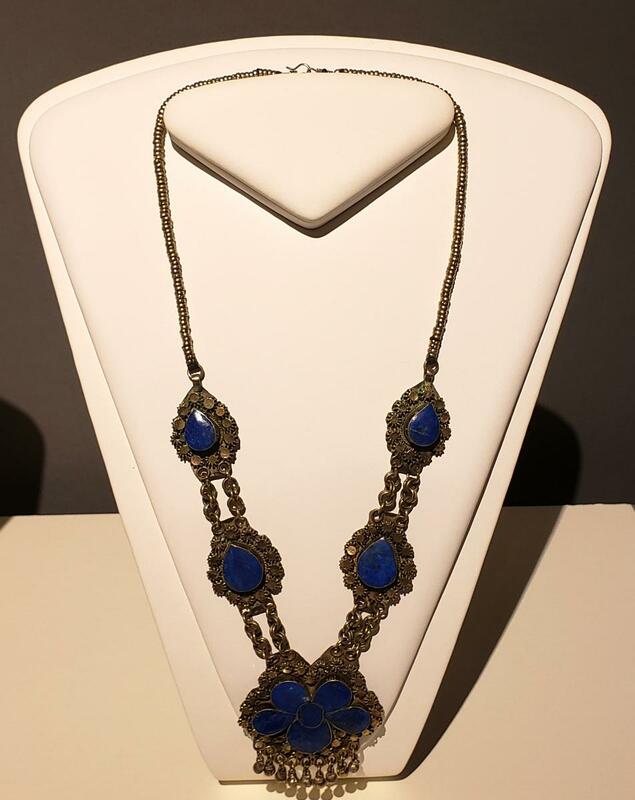 Highly valued by the ancient Sumerians, lapis lazuli had sacred associations and at times reserved for royalty. Transported back to the cities of Sumer, the rare stones were shaped and polished by hand into bead, amulets and cylinder seals. Inlaid in silver reconstructions (c. 1900) of their lost original settings, the ancient beads of these necklaces are 5,000 years old. The Rosetta Sone exhibit explores ancient civilations that arose in the region we now refer to as the Middle East. Numerour examples of sculpture, writing, pottery, jewelry, and ordinary household items reflect how each ancient empire mined and forged metals for their own purposes. These rare original relics have survived from the very dawning of civilization. From ancient Sumer to the Holy Land, the eternally compelling mystery of the sudden appearance and rapid progression of urban life is traced through pottery, cylinder seals, cuneiform tablets, bronze and marble sculpture, currency, and weaponry from its distant origins in early Mesopotamia to Canaan, Egypt, Phoenicia, Greece, Palestine, Israel, and Rome. Recovered from the same period and region as the treasures of the Baghdad Museum, this breathtaking timeline of authentic artifacts includes some of the oldest idols and sacred representations of deities ever found. 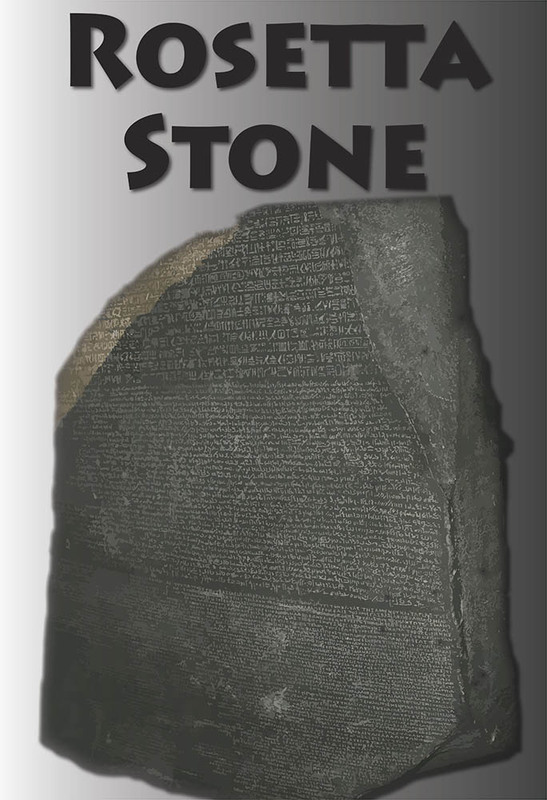 This magnificent collection features a rare cast of the famous Rosetta Stone and a replica of the mysterious Phaestos Disc. Herbert and Lou Henry Hoover travled throughout Egypt and the Middle East region and always harbored an interest in archaeology. The exhibit will include displays about the Hoover's work of translanting De Re Metallica, the first book on mining based on field reserach and observation and treaures that they collected while traveling through Egypt, including peices from Lou's jewelry collection.